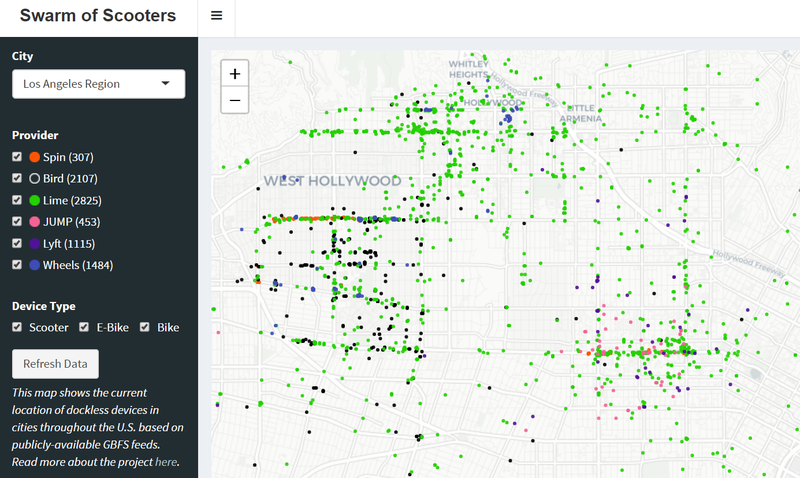 Do you know where all the scooters are in your city? You may have been following the scooter craze or have seen scooters or e-bikes pop-up on sidewalks throughout your neighborhood. Have you ever been curious about where all the scooters are located in your city? This map, built using R’s Shiny library, shows the current location of available dockless devices in cities throughout the United States . Using the map, you can filter by city (LA, NYC, etc. ), by provider (Bird, Lime, Lyft, etc. ), or by mode (scooter, e-bike, bicycle). 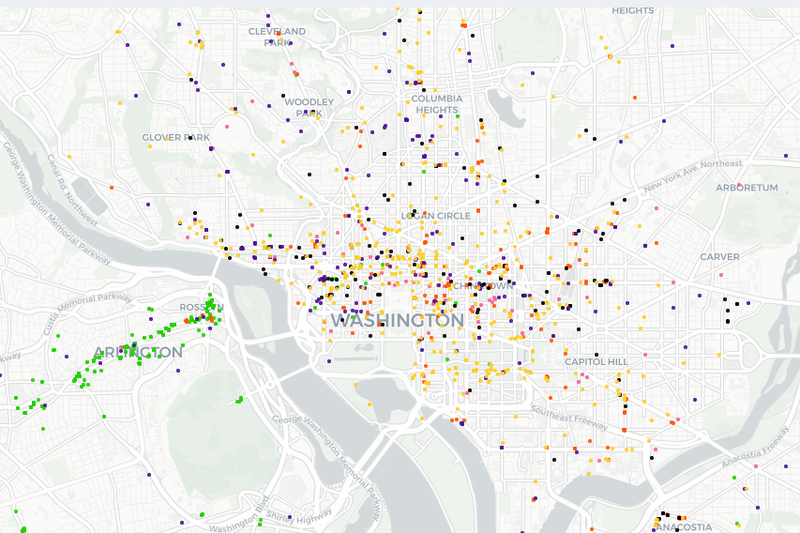 A couple of the cities (Los Angeles, Washington DC) are rich with data, and it is interesting to see which neighborhoods are more populated with scooters. You may also notice that many city maps are missing data from providers. Keep reading 👇. Availability of public data feeds: In a few cases, companies have published data voluntarily. For example, both JUMP and Bird have published open data feeds for many of the cities they are currently operating in, which is why you will see both of these providers featured in the map. However, many mobility companies do not see it as in their best interest or as one of their top priorities to publish open data feeds showing fleet availability, which would make it easier for consumers to compare services. Given the reluctance of providers to publish open data feeds, it is up to cities to require open APIs as part of the permitting process. Washington D.C. and Los Angeles have been leaders in this regard, which is why you will see several providers on each of those maps (disclosure: I previously worked at the Los Angeles Department of Transportation in the group that managed dockless mobility permits). The table here lists the data feeds for dockless mobility companies that I was able to find, all which are incorporated into the map. Lack of Data Standard: Dockless mobility operations are so new that there has yet to emerge a clear consensus on an appropriate data standard that is inclusive of all the emerging options. Our best bet is a modified version of the General Bikeshare Feed Specification (GBFS) that is maintained by the North American Bike Share Association (NABSA). Although GBFS was originally designed for docked bikeshare, it can be adapted fairly easily to cover the broader category of dockless devices as well, which is what has happened for the data feeds displayed in the map. However, without clear guidelines on how devices like scooters should be represented in GBFS (and strict enforcement of these standards), companies have modified the standard differently, adding to the complexity when aggregating the data. Differences include the pagination of the endpoints, the geographic boundaries of the feed (is Santa Monica part of LA or not? ), classification of the device type ("electric_scooter” or "scooter”?) and lack of adherence to basic GBFS guidelines. It is likely we will see improvement on both data availability and data standards in the near future. Cities have identified fleet availability data as one of the top priorities in a data policy needs survey. With regards to standards, it looks like NABSA is considering a broad update for GBFS that will cover dockless mobility options such as scooters and e-bikes. As new feeds are published and data is re-formatted, I will update the map accordingly. Do you know of any other dockless GBFS feeds I am missing? Do you have any ideas for how the map could be improved? Let me know and I’ll do my best to update the map.